Using a superfluid atomtronic circuit, JQI physicists, led by Gretchen Campbell, have demonstrated a tool that is critical to electronics: hysteresis. This is the first time that hysteresis has been observed in an ultracold atomic gas. 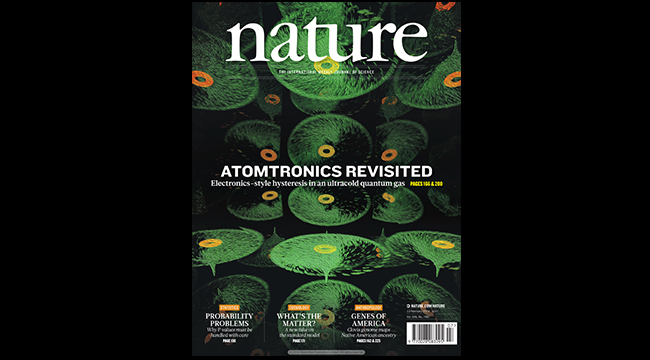 This research is published in the February 13 issue of Nature magazine, whose cover features an artistic impression of the atomtronic system. Lead author Stephen Eckel explains, “Hysteresis is ubiquitous in electronics. For example, this effect is used in writing information to hard drives as well as other memory devices. It’s also used in certain types of sensors and in noise filters such as the Schmitt trigger.” Here is an example demonstrating how this common trigger is employed to provide hysteresis. Consider an air-conditioning thermostat, which contains a switch to regulate a fan. The user sets a desired temperature. When the room air exceeds this temperature, a fan switches on to cool the room. When does the fan know to turn off? The fan actually brings the temperature lower to a different set-point before turning off. This mismatch between the turn-on and turn-off temperature set-points is an example of hysteresis and prevents fast switching of the fan, which would be highly inefficient. In the above example, the hysteresis is programmed into the electronic circuit. In this research, physicists observed hysteresis that is an inherent natural property of a quantum fluid. 400,000 sodium atoms are cooled to condensation, forming a type of quantum matter called a Bose-Einstein condensate (BEC), which has a temperature around 0.000000100 Kelvin (0 Kelvin is absolute zero). The atoms reside in a doughnut-shaped trap that is only marginally bigger than a human red blood cell. 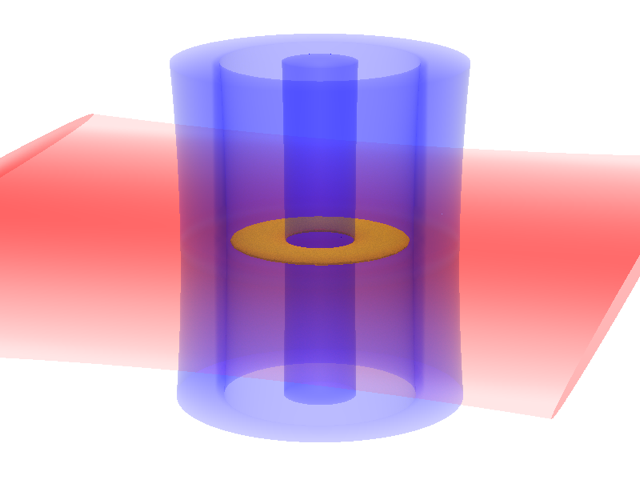 A focused laser beam intersects the ring trap and is used to stir the quantum fluid around the ring. While BECs are made from a dilute gas of atoms less dense than air, they have unusual collective properties, making them more like a fluid—or in this case a superfluid. What does this mean? First discovered in liquid helium in 1937, this form of matter, under some conditions, can flow persistently, undeterred by friction. A consequence of this behavior is that the fluid flow or rotational velocity around the team’s ring trap is quantized, meaning it can only spin at certain specific speeds. This is unlike a non-quantum (classical) system, where its rotation can vary continuously and the viscosity of the fluid plays a substantial role. Because of the characteristic lack of viscosity in a superfluid, stirring this system induces drastically different behavior. Here, physicists stir the quantum fluid, yet the fluid does not speed up continuously. At a critical stir-rate the fluid jumps from having no-rotation to rotating at a fixed velocity. The stable velocities are a multiple of a quantity that is determined by the trap size and the atomic mass. This same laboratory has previously demonstrated persistent currents and this quantized velocity behavior in superfluid atomic gases. Now they have explored what happens when they try to stop the rotation, or reverse the system back to its initial velocity state. Without hysteresis, they could achieve this by reducing the stir-rate back below the critical value causing the rotation to cease. In fact, they observe that they have to go far below the critical stir-rate, and in some cases reverse the direction of stirring, to see the fluid return to the lower quantum velocity state. This two-velocity state quantum system has the ingredients for making a qubit. However, this idea has some significant obstacles to overcome before it could be a viable choice. Atomtronics is a young technology and physicists are still trying to understand these systems and their potential. One current focus for Campbell’s team includes exploring the properties and capabilities of the novel device by adding complexities such as a second ring. This research was supported by the NSF Physics Frontier Center at JQI.